I’m sitting at my computer with the fan on high, the sun threatening to burn me through the open window and I’m getting ready to tell you about a soup that encompasses all that I love about Summer. I’m sure you are saying to yourself right now – soup? In the middle of summer! Crazy – I know but I can’t help myself. Soup is one of my favorite things to eat and when the weather heats up and the corn turns sweet and the peppers get spicy all I want to do is whirl the two into a silky soup. In fact, it was about this time last year that I shared another corn soup. 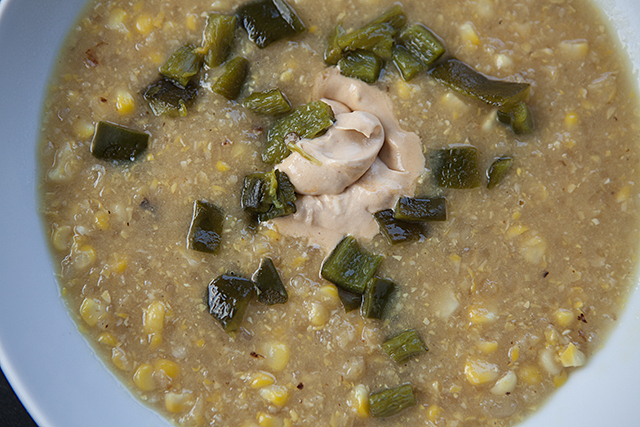 You may need a cool rag on your neck as you let the cobs simmer in broth and you peel away the skin on your blistered poblano peppers but believe me, it will be worth it. This soup is a beautiful combination of sweet with a little heat and a hint of smokiness from the chipotle mascarpone you’ll use to finish the soup. Make sure to cook a double batch so you can freeze half of it to enjoy when the temperature drops and your body yearns for something warm. 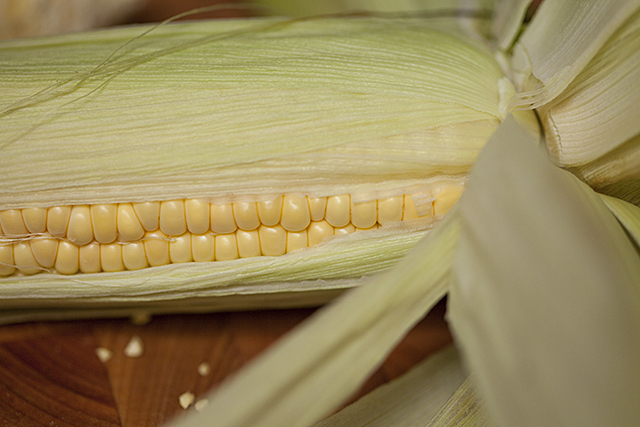 First you’ll want to shuck the corn from the cob into a bowl and set aside. Make sure you hang on to the cobs. In a large pot, sauté the onions and garlic until translucent. I usually add the garlic towards the end so that the flavor penetrates the onions without burning. Next add half of the corn from the bowl and cook until everything starts to turn a delicious caramel color. Now it’s time to add the broth and the cobs. I used bone broth in this dish because it is super rich in minerals and is very healing for the body but feel free to use your favorite veggie stock as well. Let the soup simmer for 20 minutes before removing the cobs and pureeing the soup with a stick blender. Next, whisk in the cornstarch, the remaining corn kernels (reserving a small handful) and season with salt and pepper. While the soup simmers roast your peppers under the broiler or on the grill. You want them good and blistered and mostly black. Once they are good and charred let them sit in a brown bag for 5 – 10 minutes until they are easy to handle. Run the peppers under cool water using your fingers to slide the skins off and remove the stem and seeds. Chop and set-aside. To serve, ladle the soup into bowls, add a dollop of mascarpone cheese seasoned with smoky chipotle sauce and sprinkle with the remaining corn and chopped poblano peppers. Enjoy with a yellow watermelon and goat cheese salad and a cold beer. 6 Ears Of Corn, Shucked, Cobs Reserved. 2 Tablespoons Grapeseed Oil or Safflower Oil. Sauté onion and garlic in 2 tablespoons grapeseed oil. 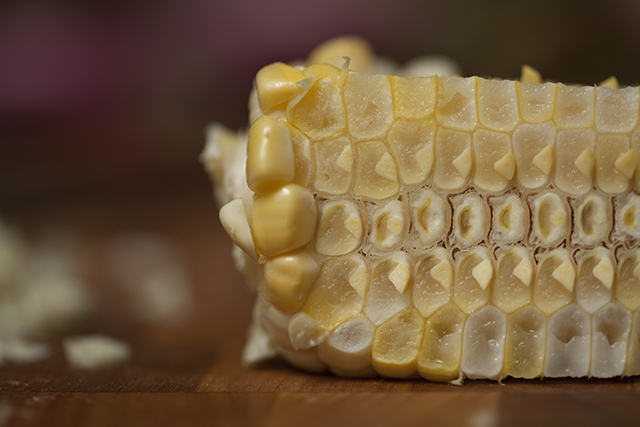 When translucent add half of the corn and sauté until starting to brown 5 – 10 minutes. Add the broth and the corncobs and simmer for 20 minutes. Roast the poblano peppers until blackened and blistered. Let cool in a brown paper bag. Peel and seed the peppers when cool enough to handle. 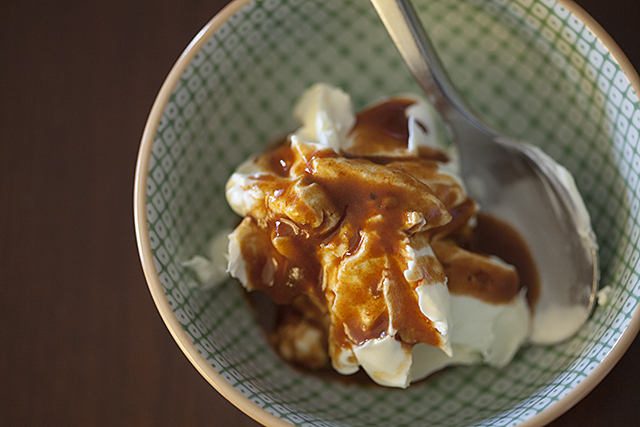 Mix the mascarpone with 1 – 2 tablespoons of chipotle in adobo sauce and season with salt. Add more to increase the heat factor. 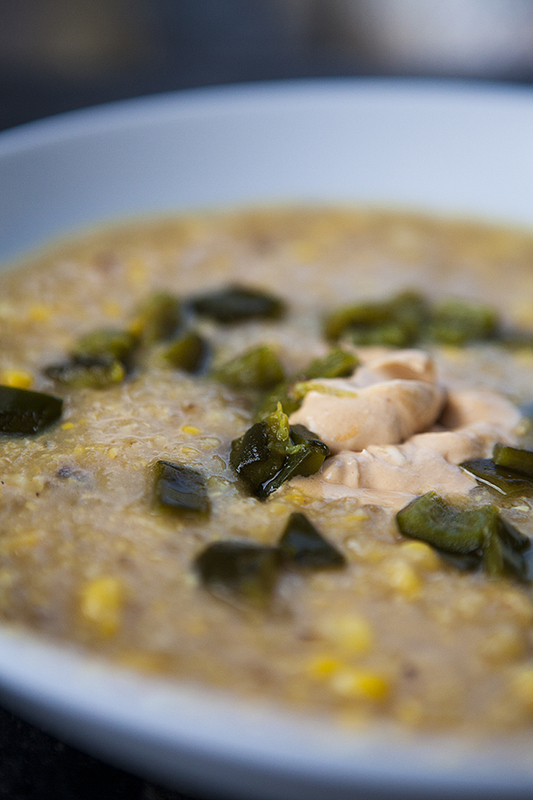 Remove cobs from the broth and puree soup with a stick or regular blender. Whisk in cornstarch and most of the remaining corn. Leave a small handful. Season with salt and pepper. Ladle into bowls and sprinkle with remaining corn, chopped peppers and a dollop of chipotle mascarpone cheese. « let there be veggies! haha. very true. let me know how it turns out! an acai bowl sounds amazing right now! Sounds sooo good! I’m adding this to the top of my list of recipes to try.